Universal attachment: vacuum cleaner attachment works with most standard sized vacuum hoses. the blue part is detachable to adapt with smaller or bigger hose. Easy to use: Just connect this to your vacuum and you can clean as seen as on TV, flexible tubes, strong suction and long size all of this can impress you deeply. 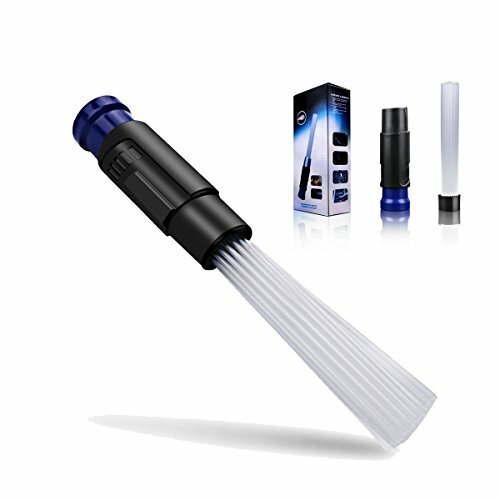 Used everywhere: There are somewhere you can\'t clean clearly with normal tools, but not with this one, you can use it to clean your draw, corners, even your pets. Perfect remove dust: No need to move objects anymore, flexible tubes can fix all. Long and flexible tubes have access to any deep corners, no longer need to do more job. Save your time: With this product, your home cleaning tasks will most certainly be a lot faster to do and will result in a better clean of your home as well. It works great. It's bigger than I was expecting, but it's powerful. It gets into those small areas, like my PC keyboard.